Did you know Chester County is expected to be the fastest growing county in southeastern Pennsylvania in the next 30 years? 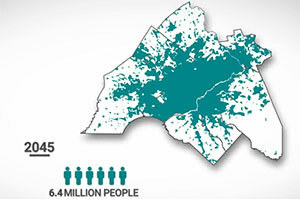 In fact, there will be 146,000 new residents and 88,000 more jobs in Chester County in the next 30 years, according to Delaware Valley Regional Planning Commission (DVRPC) estimates. The DVRPC highlighted these facts and other regional trends and forecasts in “Connections 2045 Plan for Greater Philadelphia,” a long-range plan for the region’s future. Check out the DVRPC’s new video about the plan. View more information about the DVRPC’s plan. The Chester County Planning Commission is addressing the DVRPC’s growth projections as it continues to develop Landscapes3, a long-range plan for Chester County’s future. Learn more about Landscapes3.